NEW YORK—Light rain early on June 21 didn’t stop members from attending The Alumni Society’s fourth annual Leadership Summit in New York City. More than 250 high-caliber Alumni Society members attended the half-day conference and networking event, which was held in partnership with Bank of America, Capital One, Cracker Barrel, Goldman Sachs, HP Inc., Eli Lilly, and T-Mobile. “As one grows, we all grow,” Sanchez told attendees and encouraged them to connect and start building their network of ten thousand. Gerry Lopez, former CEO of Extended Stay America and AMC Theaters, answers a question from Rafael Diaz-Granados (left). 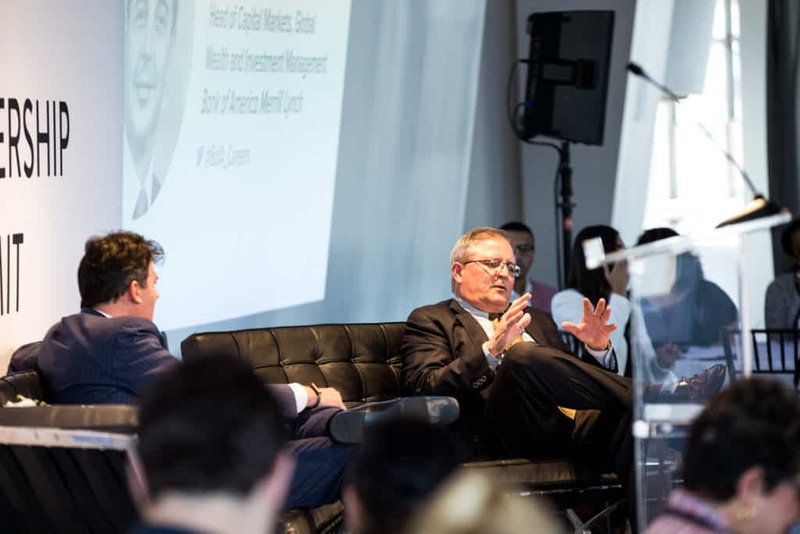 The first session of the Summit was the CEO Spotlight, which featured a conversation between former CEO Gerry Lopez and Alumni Society ambassador and executive consultant Rafael Diaz-Granados. Lopez is the former CEO of Extended Stay America and AMC Theaters and is a Class of 2016 honoree. 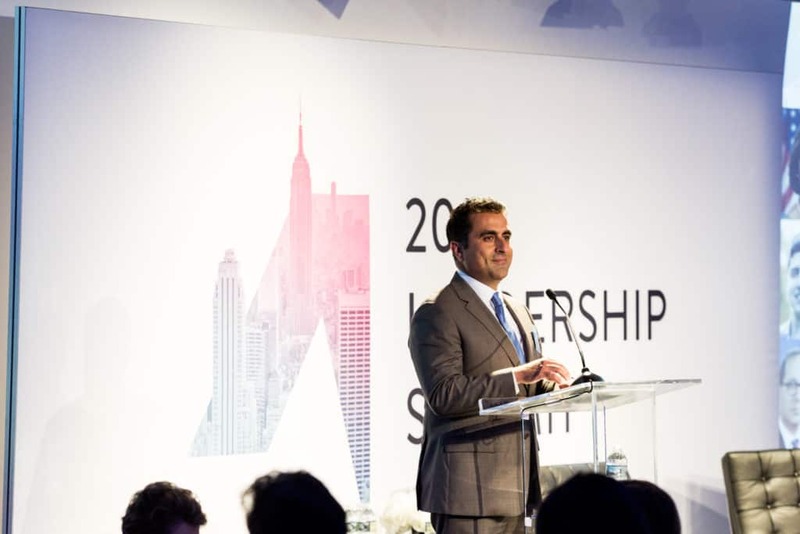 During his career journey, Lopez has held roles in a variety of industries: hospitality, entertainment, multiunit retail, food & beverage, consumer packaged goods, and supply chain. He shared how important it is as a leader to hold on to your values. He talked about Starbucks—where he previously served as executive vice president and president of Global Consumer Products—shutting down its stores for employee training on racial bias. 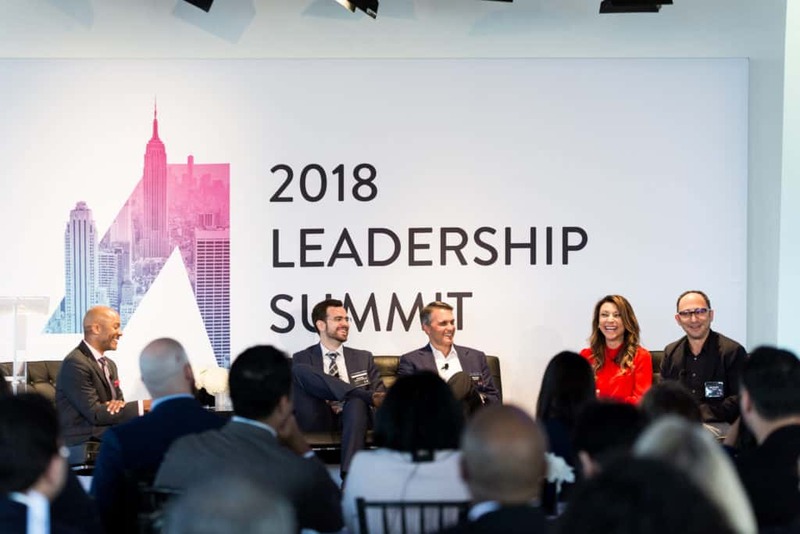 From left: Dotcy Isom III, vice president of human resources, employee career development at T-Mobile; Miguel González Herranz, cofounder and COO of FounderNest; Konrad Schwarz, EVP and head of strategic commercial services for commercial banking at Capital One; Liliana Gil, CEO and cofounder of Cien+; and Michael Cerda, chief products officer for Marcus at Goldman Sachs. The second Leadership Session featured a dynamic panel on knowing when it is the right time to take a leap in your career. Participants included Miguel González Herranz, cofounder and COO of FounderNest; Konrad Schwarz, EVP and head of strategic commercial services for commercial banking at Capital One; Michael Cerda, chief products officer for Marcus at Goldman Sachs; and Liliana Gil, CEO and cofounder of Cien+. Dotcy Isom III, vice president of human resources, employee career development at T-Mobile, served as the moderator. The session included perspectives on taking chances in your career, whether you’re choosing to become an entrepreneur or want to apply an entrepreneurial mindset in a corporate setting. And activating change doesn’t always mean becoming an entrepreneur. “Find ways you can be distinguished from the rest of the pack and look where your skill set can help,” Schwarz said, speaking about his experiences at Capital One. There are many global opportunities leaders can take a chance on as well. “Stay humble and respectful to the culture,” advised González Herranz, who is a Class of 2018 honoree. “Be respectful and truthful to yourself. If you’re that way, no matter the culture or the country, you’re setting yourself up for success. 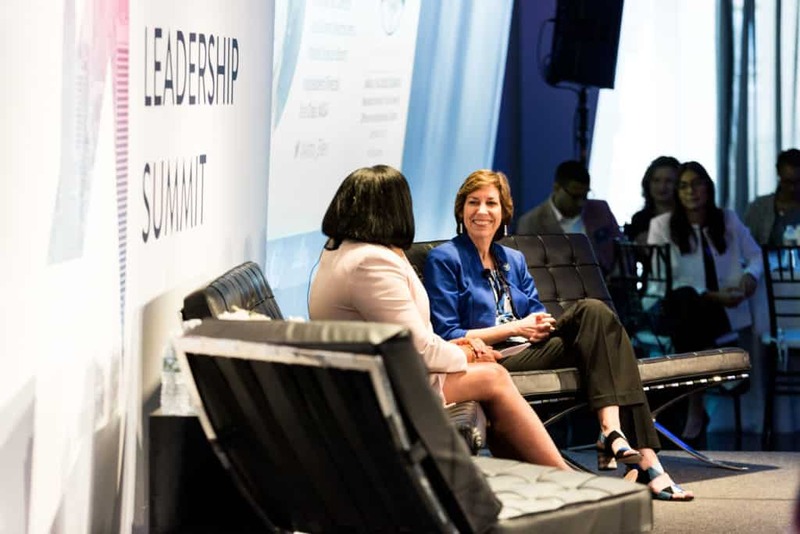 Ellen Ochoa, veteran astronaut and former director of Johnson Space Center, chats with Anilu Vazquez-Ubarri, managing director, chief diversity officer and global head of talent at Goldman Sachs. 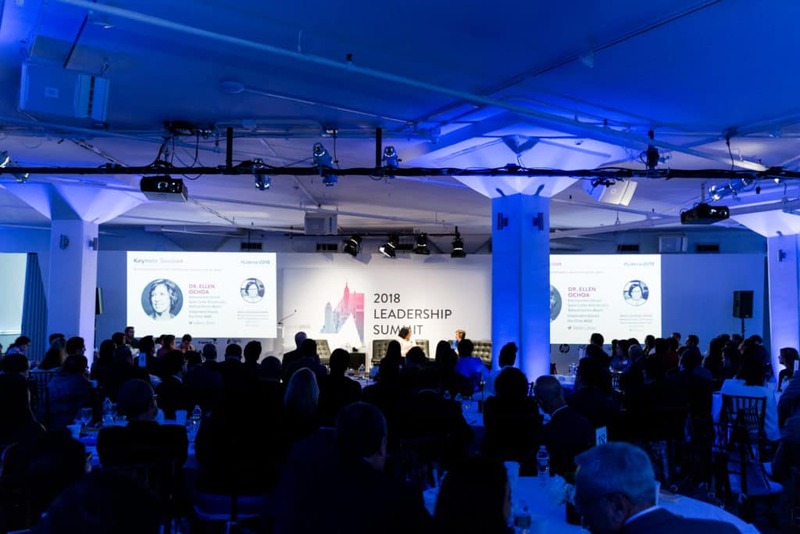 This year’s keynote session featured veteran astronaut Ellen Ochoa in conversation with Goldman Sachs’ managing director, chief diversity officer and global head of talent, Anilu Vazquez-Ubarri. The session began with a short video, which highlighted Ochoa’s career at the first Hispanic woman in space and the first Hispanic director of NASA’s Johnson Space center. Ochoa, who is a Class of 2018 honoree, spoke about the opportunities being the first has given her and how leaders can handle failure. Being the first—Hispanic woman in space and Hispanic director—has led to Ochoa giving more than 300 talks to a variety of audiences. Ochoa earned her bachelor’s degree from San Diego State, and went on to earn her master’s degree and doctorate at Stanford. Her success at NASA also led to six schools, pre-K through high school, named after her. “It’s a huge honor. Education is so important in my life. . . . It’s so fun to go to these schools. They’re always so shocked that you’re still alive,” she said with a laugh. Ochoa also shared what it’s like to be in space. During her time as an astronaut, she logged one thousand hours in orbit. “It’s unlike any experience,” Ochoa says of her time in space. “There are two things that are different: the ability to view the earth from space and working in a microgravity environment. The Alumni Society has grown to more than 3,000 members in the past four years and each year, an annual Class of the Society’s most esteemed members is chosen. Guerrero noted that in the past, the Society has released a book featuring the twenty-five Class members. This year, all features will be posted online over the next five months but “we wanted you to hear directly from the Class members themselves,” Guerrero said. Alongside the Class of 2018, The Alumni Society launched its first-ever podcast, The New Majority. The podcast will be hosted by Society member Mauricio Cruz. Guerrero shared the trailer for The New Majority with Summit attendees. Back row: Codie Sanchez, CS Ventures; Chris Perez, Goldman Sachs; Rami Reyes, NextEquity Partners; Miguel González Herranz, FounderNest; Jorge Casimiro, Nike; and Julian Parra, Bank of America Merrill Lynch. Front row: Laura Marquez, Google; Francesca de Quesada Covey, Facebook; Ellen Ochoa, NASA (retired); Adela Cepeda, PFM Advisory; and Rita Mitijans, ADP. 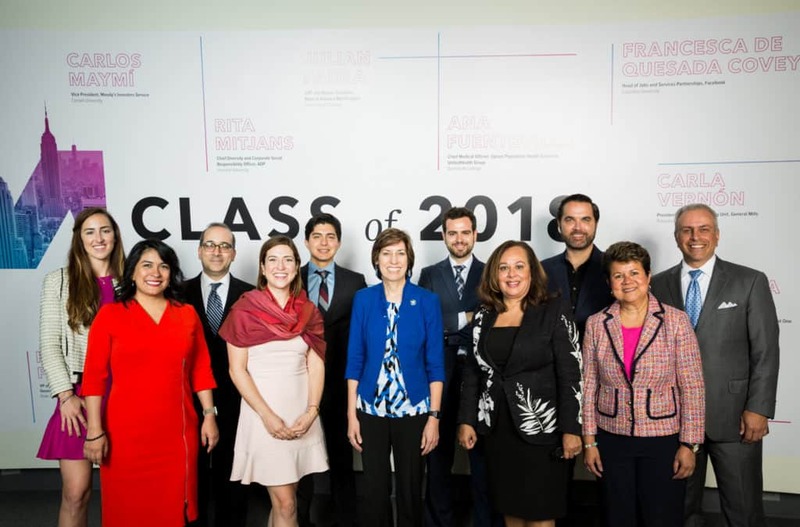 Guerrero closed with recognizing the Class of 2018 honorees in the room: Codie Sanchez, CS Ventures; Chris Perez, Goldman Sachs; Rami Reyes, NextEquity Partners; Miguel González Herranz, FounderNest; Jorge Casimiro, Nike; and Julian Parra, Bank of America Merrill Lynch; Laura Marquez, Google; Francesca de Quesada Covey, Facebook; Ellen Ochoa, NASA (retired); Adela Cepeda, PFM Advisory; Rita Mitijans, ADP; and Eva Hughes, Adira Consulting. Photos from the Leadership Summit can be found on our Facebook page.